Six steps to help your Quarterbacks read defenses like a pro. There is no more loaded question in all of Quarterback training than the one posed above. It is a question I frequently get asked, and quite frankly I get asked by coaches who themselves have no idea how to read a defense. Reading defenses is not a one size fits all type of question, it would be like asking what is the correct arm slot for a Quarterback, well, the answer varies for every Quarterback and this question varies based on every system. The good news is that there are six steps to begin teaching your Quarterbacks how to read, recognize, and most importantly identify the defense they are going against. I want to also point out one simple thing, this is not solely for NFL Quarterbacks: this is how to help all Quarterbacks. All of these apply to every level of the game. You may need to teach different indicators depending on whether your QB is playing at the Youth, High School, D-1, or NFL level but that is the only aspect that will change. Every great Quarterback must be able to handle all of the six steps, and it is up to you as a coach to give them the best opportunity to do so! It always amazes me how often coaches skip this. As coaches we can’t expect a kid who has never played Quarterback or who is new to our program to just know how defenses operate. The first thing we need to do is teach Quarterbacks the defensive side of the ball. If you have access to a great Defensive Coordinator then have the Quarterbacks sit in on some of their meetings to help them get a deeper understanding of the other side of the ball. Personnel – This is where they learn the difference between base 4-3 and base 3-4, what happens when Nickel personnel comes in the game, what happens when a dime comes in the game, what happens when the defense goes light, and just as important what happens when the defense gets into heavy. Coverage – We immediately then jump into coverage and here’s why: You need to get them hooked, feed them exactly what they are craving, show them the vulnerabilities in each coverage, how to recognize each coverage pre-snap, where to go with the ball. This will get them chomping at the bit to learn more and more about defense and in turn, they will never digress or question why they are learning this part of the game. Linebacker Alignments – Now you feed them some vegetables. This is the part that no one gets out of bed excited for. While it may not be as interesting as coverages, they need to know and understand the difference between when the backers are bossed to the strongside and when they are bowed to the weak side, they need to know why the Sam linebacker is out, walked, or apexed. This is where they will start to understand how to capitalize on leverage in the pass game. Fronts – What’s better than some of the vegetables, all of the vegetables. Teach them all about fronts: why do teams get into an over front, why are other teams in an odd front, and so on and so forth. Make them understand run game vulnerabilities, and which run plays match each look. Help them figure out why we want a run bubble on certain plays, and why we don’t on others. Stunts – This is where you will take their defensive identification knowledge and apply it to pass protection. Sick of seeing your QB getting sacked, well why don’t you help him identify defensive fronts instead of blaming the offensive line coach and yelling at your QB to “get rid of the ball”? Help them see the difference between a TE stunt and an ET and why defensive coordinators dial them up. Apply it to your protections and pre-snap protection checks: what stunts hurt us in full slide, what hurt us in man, what hurt us in combo. Help them identify when they’ll be vulnerable in protection and when they can bet on being more comfortable in the pocket. Heat – Finally, bring it all home by helping them understand why they will be hot, when they will be hot, and how. Cover everything from single pressure Will off the edge, to secondary Blitz, and two plus linebacker dogs. Make sure they know why SAW hurts us just as much as how we will account for the weak side corner if he comes from the boundary. If you can 1) teach and 2) implement those six sections, then your Quarterbacks will have knowledge base to build on as you ask them to identify and recall defenses they go against. Also a really quick side note: if as a coach, you don’t feel comfortable or you don’t quite know what all of those sections are, then please check out our online academy. You’ll specifically want to study up on the defensive identification course. We have coaches that sign their Quarterbacks up for the Online Academy just to train them on defensive identification. From here on out everything will apply to one thing and one thing only: reading defenses in-game. By now your Quarterbacks have a base understanding of what defenses are trying to do to them. We should have spent all off-season talking them through the different defenses and how to attack them or how we protect against them, now it is time to give them the proper training on how to make sure they don’t miss anything. The first in-game / in-practice step is to check the down and distance. I highly recommend that you put down and distance markers out at practice, however I know a lot of you reading this are coaches at the high school or youth level and that is not completely realistic. You can always yell out the situation to your Quarterback as well, but make him acknowledge it. Third and six, you need to see that in his eyes that he understands the situation. The reason we need to know Down and Distance is because it helps Quarterbacks recall and identify which defensive look they’ll face. Each week we should give them a down and distance report, with the top 3-5 defenses they will face on each down and distance. This will help them go through their checklist in practice situations. For example, first and ten, they show cover 2 65% of the time and a form of closed coverage the other 35%. Building this into their process will help them recognize and process faster. Once we break the huddle (if we huddle that is) their first job as a Quarterback is to identify down lineman. In college I got in the habit of calling it out for our offensive line. This would sound something like, “Four Down, Four Down, Mike is 58” meaning there are four down lineman and then identifying the Mike. Once we have an idea of how many linemen are in the game we can make a Mike Identification. Every Quarterback needs to be able to ID the Mike before the snap to set protection and/or the run game for the offensive line. After we identify who the Mike is, we need to find the alignments for the rest of the linebackers. I preferred to check from the strength to the weak side when I was identifying, always locating the Sam and then working to find out where the Will was. It’s also important to identify whether there is an extra defensive back in the game, which will lead us to find out what defensive personnel we are going against on each snap. Now let’s have some fun! We know what personnel is in the game, the front, and the linebacker alignments. Once the Quarterback works strong side to weak side he then should let his eyes carry up to the free safety. Immediately he needs to recognize what coverage family he is going against. Is the middle of the field open or is the middle of the field closed? Breaking it down further, for coaches who may not be following along when I say “open”, I mean split safety, there are two safeties deep, and when I say “closed” I mean closed safety, there is only one safety deep in the middle of the field. After identifying whether it is open or closed, QB’s can then scan to the corners. Looking at the corners will help them fit the whole piece together. If you have split safeties meaning “open” and both corners are down near the line of scrimmage the likelihood of Cover 2 increases. Knowing from the down and distance report that on first and ten your opponent is in Cover 2 65% of the time, your QB’s will easily anticipate the correct coverage. Once we have our front, linebacker alignments, and coverage worked out, it is time to make sure we don’t get hit in the mouth. This is why you train your Quarterback to work through his heat indicators. Is a safety rolling down directly behind an outside linebacker? If so, then alert pressure off the edge. Is a safety creeping way to far off the hash to the boundary? If so, then alert weak corner blitz. 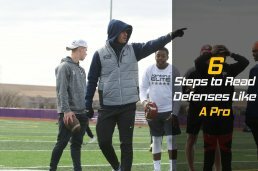 These are the tips we should be working through and making sure our Quarterbacks are ready for them. Lastly with the heat indicators, we need to make sure our protection can handle what they are bringing. If the defense is bringing more than we can handle, we need to have proper hot adjustments so our Quarterback can let it go quickly or we need to have built in protection checks so the Quarterback can get into a better protection. The last step in the process of reading defenses is post snap eye placement. This is tricky because not all offenses are created equal. At the highest level Quarterbacks need to double check that they are not hot and then begin executing their progression. Do we have a pure progression offense, built on checking from 1-2-3-4 and so on or do we have a pre & post snap look offense, built on looking to a certain side against each different type of coverage? What I would recommend for post snap eye placement, is make sure that you are not hot, take a peak for a coverage confirmation and then immediately hop into your progression, then let it rip. As coaches, we all need to strive to be better, learn more, and make it easier on our players. By teaching Quarterbacks the correct way to read a defense, they will in turn play faster, drive the ball, and make their reads with conviction. Increased touchdowns and decreased interceptions are what we are looking for at the end of the day. Having the answers to the test before we snap the ball will help us accomplish just that. — NOW GO GET THE ANSWERS TO THE TEST!